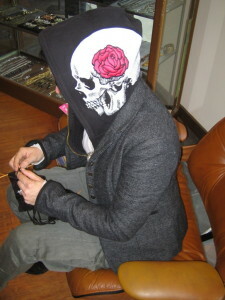 jules blog: Tag, I'm it!!! My family helped me decide what to put!!! 1) I'm living in Virginia (and that is weird in itself, but the story goes on) I am from the Southwest and miss it terribly, so I am turning my house into a Southwestern shrine. My latest endeavor is fixing up the entry way in my house. 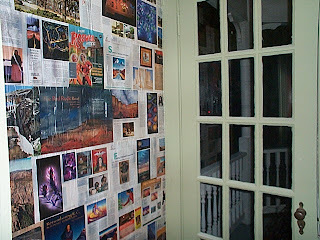 I decoupaged it with New Mexico magazine pages over the entire walls. I'm not sure if I like it, but I love all the pictures and they almost all mean something to me. 2) My girls helped me with this one also. My favorite color is orange and maybe I go a bit overboard with it at times-- my clothes, the walls in my house, etc. 3) Kale... I was in a vegetable co-op this summer and they gave me an abundance of kale weekly. Thus, I took kale everywhere I went. I took it when I went and visited people and stayed at their house. THe last place I took it was to a Christmas party, where I was supposed to bring appetizers. This is the year of KALE! 4)My family suggested this also-- we are very piggy when it comes to cherries. We went and stayed with a family this summer. We ate one box of cherries in one day. Our hostess went out and bought another box-- we ate that in one day too. She went out and bought another box, we finally slowed down!!! 5) I am already knitting for Valentines Day- but that's only because I got a cool knitting book for Xmas and can't resist one of the projects!!! I am so glad that you blogged your answers and Bill and I had fun reading them!! I am going to keep tagging you so you have to post on your blog more often! !